We pride ourselves on being one of York's leading waste management companies, we specialise in both domestic and commercial skip hire. We have an excellent customer service team and are able to offer highly competitive skip hire prices, please call our team today on 01904 488632 or request a call back at the top of the page. We have a high level of customer service whether it is a small domestic job or a larger commercial project, we can provide competitive quotes based on your individual skip hire requirements, our customer service team can also advise on exactly the right product for you based on your skip hire needs. These skips are delivered on a smaller lorry making it ideal for limited access. 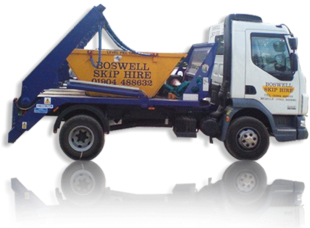 These skips are often hired for bathrooms or kitchens. These skips are usually delivered on a smaller lorry making it ideal for limited access. Our Builders skips are ideally sized for larger scale clearance of waste. All builders skips come with a drop down door. Our jumbo skips are ideally sized for larger scale clearance of waste. All jumbo skips come with a drop down door. If you require your skip to go on the public highway then you will need a permit from your local authority. Our customer service team will organise this on the customer's behalf. York City Council Immediate licences are available at an additional charge otherwise three working days notice are required. The permit will last for 14 days. We are also able to offer a wait and load service to keep the customers costs to a minimum, our wait and load service provides a lorry together with an empty skip to the address you require, the lorry will up to 45 minutes whilst the skip is filled, the skip is then taken away without any fuss or the need for a permit. We are committed to reducing the environmental impact associated with waste management and skip hire, in the current climate, with the focus on sustainability and costs, our goal of recycling is providing additional benefits such as enabling our customers to reduce their carbon footprint and be fully sustainable in many areas of their work. Recycled paper can be used in a number of industries including the newspaper print Industry. Recycled paper produces 73% less air pollution than if it were made from raw materials. We are able to divert and recycle all grades of plastic from plastic film to solid plastics. One recycled plastic bottle would save enough energy to power a 30 watt light bulb for 6 hours. 275,000 tonnes of plastic are used each year in the UK which equates to approximately 15 million bottles per year. Plastic can take up 500 years to decompose. We are able to stream timbers into two main grades for recycling. Clean timber is chipped and sent for reuse in chipboard or animal bedding. Dirty timber is shredded before reuse.